Robert Wolfe is recognised as one of the world’s leading interpreters of the theatre organ. Acclaimed for his sheer artistry, renowned for his musicality, he is without question one of the top British organists. At the age of sixteen, he became the youngest musician at that time to join the team of organists at the world famous Tower Ballroom, Blackpool. After three years, in 1981, he was invited to inaugurate the Wurlitzer show at the Thursford Collection, near Fakenham in Norfolk. This ‘sight and sound spectacular’ has come to be known locally, nationally and internationally as ‘The Thursford Experience’. From early spring to late autumn, seven days a week, Robert draws large crowds who delight in his warm personality and his unique musical combination of meticulous accuracy and interpretative sensitivity. He took this solo position at the age of 19. However, the story really began for Robert at the age of eleven, or thereabouts, with the gift of a small single keyboard bought as a Christmas present by his parents. In the beginning his non-musical roots meant playing wholly by ear; reading music came later. By the age of 14 he was playing a Compton theatre organ at a pub in Hertfordshire, plus other pubs and clubs in and around his hometown of Luton using his own portable Hammond electronic organ. Robert’s hopeless addiction to the theatre organ became apparent when a family summer holiday took them to Blackpool. 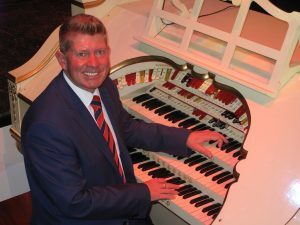 A single visit to the world famous Tower Ballroom started this infatuation, and who would have believed that two years later he would audition to join the team of organists playing for non-stop dancing? Better still, he was accepted and became the youngest musician at that time to hold such a position. Robert’s music is often heard on BBC Radio 2, and he has been featured on TV. Highlights of these broadcasts include playing live for The National Lottery, with an audience of around 20 million people hearing the magnificent sounds of the Wurlitzer organ at Thursford. During the winter months he performs concerts not only around the UK, but also the U.S.A & Canada. When not performing on pipe organs, Robert performs concerts for the many electronic organ societies here in the UK.